Is Boyd Haley resurrecting OSR#1 as a chelator? Boyd Haley was a professor of chemistry who was very active in the failed thimerosal-causes-autism movement. He earned extra notoriety for trying to coin the phrase “mad child disease” (yes, a variation of mad cow disease) for autistic children. He also found notoriety for marketing a synthetic chemical as a “nutritional supplement”, calling it OSR#1. Prof. Haley is certainly persistent. He’s working on a clinical trial. How did this come to pass? Well, one of the professors in Prof. Haley’s department found that a certain compound could effectively treat mining waste, removing mercury. Given his own interests, Mr. Haley started a company with an investor with the intent to bring this chelator to the public. The chelators used in medicine today were developed for lead and have been expanded to also treat mercury. I.e. there is no mercury specific chelator and this new compound would fill that gap. All well and good, but in his zeal to bring this product to market, Prof. Haley cut a few corners. Chelators are drugs. The compound he was working on was synthetic. But Prof. Haley chose to rush the product to market as a “nutritional supplement”. Instead of calling it a chelator, he called it OSR#1. OSR standing for “oxidative stress relief”. Mr. Haley skipped the process to prove that his drug was safe and effective. Supplements have a much lower standard for safety and efficacy testing. Your firm markets OSR#l as a dietary supplement; however, this product does not meet the definition of a dietary supplement in section 201(ff) of the Act, 21 U.S.C. § 321(ff). To be a dietary supplement, a product must, among other things, “bear[ ] or contain[ ] one or more … dietary ingredients” as defined in section 201(ff)(1) of the Act, 21 U.S.C.§ 321(ff)(1). Section 201 (ff)(1) of the Act defines “dietary ingredient” as a vitamin, mineral, amino acid, herb or other botanical, or dietary substance for use by man to supplement the diet by increasing the total dietary intake, or a concentrate, metabolite, constituent, extract or combination of any dietary ingredient from the preceding categories. The only substance listed as a dietary ingredient on the labeling of OSR#1 is N1,N3-bis(2-mercaptoethyl)isophthalamide. N1,N3-bis(2mercaptoethyl) isophthalamide is not a vitamin, mineral, amino acid, herb or other botanical, or dietary substance for use by man to supplement the diet by increasing the total dietary intake. Further, N1,N3-bis(2-mercaptoethyl)isophthalamide is not a concentrate, metabolite, constituent, extract or combination of any such dietary ingredient. Thus, because OSR#1 does not bear or contain a dietary ingredient as defined in section 201(ff)(1) of the Act, this product does not qualify as a dietary supplement under section 201(ff) of the Act. Also that the company was making claims that the drug could treat medical conditions and that the labeling was misleading in this regard. Further, that the toxicity was not adequately tested nor reported. Your website states that” [s]ome reports of temporary diarrhea, constipation, minor headaches have been reported but these are rare and the actual causes are unknown,” as well as “OSR#1 is without detectable toxicity” and “OSR#1® … has not exhibited any detectable toxic effects even at exceptionally high exposure levels.” However, animal studies that you conducted found various side effects to be associated with OSR#1 use, including, but not limited to, soiling of the anogenital area, alopecia on the lower trunk, back and legs, a dark substance on lower trunk and anogenital area, abnormalities of the pancreas, and lymphoid hyperplasia. Based on these animal studies and side effects known to be associated with chelating products that have a similar mechanism of action to OSR#1, we believe the use of your product has the potential to cause side effects, and the before-mentioned website statements falsely assert that the product does not have the potential to cause side effects. Therefore, these statements render your product’s labeling false or misleading. As such, OSR#1 is misbranded under section 502(a) of the Act, 21 U.S.C. § 352(a). The story on Mr. Haley’s Company, CTI Science, has contracted with another company, PCI Synthesis, to manufacture the new compound. “The effort to develop the compound as a mercury poisoning therapy accelerated in 2010 when the company received notification from FDA that it couldn’t market NBMI as a nutritional supplement until it underwent the full drug approval process”. As we’ve just seen above, the compound is not a nutritional supplement at all. It needs the drug approval process because it is a drug. Which was part of the sales pitch for the OSR#1 in the old days and, again, the FDA disagreed. Just because something is synthesized from a natural product, that doesn’t make it a natural product. Otherwise there would be no synthetic products at all. Everything at some level comes from a natural product. Think about that a moment. Apparently OSR#1 was sold with more impurities than would meet this standard–a standard for food and dietary supplements. $1.5M in sales. And the only reason it wasn’t higher was because the FDA stepped in. It was only out for about a year, as I recall. So, even if you believe in the failed mercury hypothesis. What exactly were you supposed to get from this compound? I somehow doubt that even the strong believers in the mercury hypothesis think that removing mercury from, say, your liver will cure autism. It does seem that Mr. Haley and his company are doing some of the right things now. Show that this drug is safe and effective for its intended purpose: chelation. There are some problematical statements that they may market this not as a drug but as a nutritional supplement, which is a non-starter. ← Robert Kennedy, where did you go wrong? And I’m not talking about thimerosal. The available data demonstrate no efficacy, i.e. elimination of mercury from the brain and rather serious adverse reactions but is making the purveyor money. This appears to be a theme amongst the biomeddling crowd. I simply can’t get my head around the level of desperation required to be so willfully duped. You are mistaken. No chelating agent, i.e. DMPS, DMSA or EDTA can cross the blood-brain barrier and at no point has ability to remove Hg from the brain been a definition of a chelating agent. Lipoic acid is able to do this but is not a chelator of choice. So your definition of efficacy is erroneous. In addition, the adverse reactions you cite are from what I understand mispresentations based on data from other related alternative molecules, not the actual NBMI. ‘Serious adverse effects’ for NBMI is a pure fiction. If you want to slate the product, then cite some references, my dear! The wikipedia entries for the drug are hopelessly inaccurate and can’t even get the name of the company founder correct. Did you even read the article and comment you were responding to? How can you say that to “The available data demonstrate no efficacy”? Did you even read the article and comment you were responding to? I’m having trouble figuring out where the comment you were responding to is. Matt deleted it. It may have been odd spam because there was no link. Just someone berating Science Mom, and saying even EDTA, etc don’t chelate mercury out of the brain and suggesting something about lipid. Sorry–sent it to spam erroneously. Now it’s back. 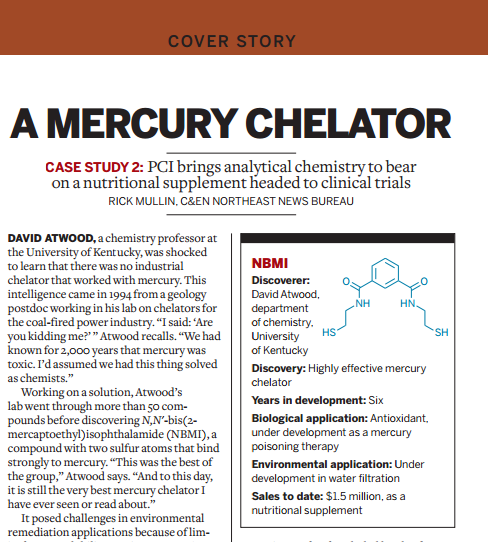 Actually, no chelator has been approved for mercury. The current chelators are lead specific, used off label for mercury. I note that Funk Flow avoids touching on the unethical practice of selling a synthetic compound as a “supplement” with minimal (which is being generous) safety testing. That’s the actual argument here. And, gee, I am sort of lost on the point of how the fact that all chelators don’t chelate from the brain is relevant here. How many millions of pills have been sold to parents as an “autism cure”? All “Funk Flow” has done is shown that Science Mom is right–people have been duped. I would beg to differ, on my sources of information, on the efficacy of Alpha Lipoic Acid R-S in the chelating of mercury from brain and organ tissues. There are reputable and corroborating findings that shows R-S Alpha Lipoic ACID R-S ALA, as both effective and non-toxic, when used as medically prescribed. Why didn’t you post the links or PubMed indexed papers? You are posting to an almost two year old article, surely you’ve had enough time to learn how to actually cite citations. OSR#1 had extensive testing. Including rodents given hundreds of times the recommended dosage by weight for months and no pathology or toxicity seen. Including giving rats up to eleven times the lethal dose of mercury injected into them, then given OSR#1 and they lived normal full term lives as if nothing had been done to harm them. Dr Haley tried to give society an inexpensive supplement but now he’s forced to prove it’s safety and efficacy again but when it comes back on the market as a drug I’m sure it will be much more expensive thanks to certain greedy people that would benefit from trying to disassociate thimerosal and or aluminum containing vaccines with autism. I used it in my biologic dental practice for about eight years and have seen nothing but great results. Can you point me to Mr. Haley’s study on the safety? Peer reviewed? And, having performed animal studies, can you point me to where he then did a trial on humans? Mr. Haley skirted the law by labeling this substance as a “supplement”. The fact that he was just required to pull it off the market (after having sold over $1M in product) with no actual consequences is just astounding. OK. What is your usual intake of this chemical? Since you are calling it a supplement, it must be supplementing something. Given that it is a novel synthetic compound, i.e. not found in nature, it isn’t a supplement. Is DMSA (another chelating compound) a “supplement”? No. It’s a drug. Mr. Haley called a drug a supplement and made a lot of money selling it to people with the wink and a nod about the fact that it was, in fact, a chelator. A drug. And, yeah, asking him to actually show safety and efficacy is us being greedy. Rushing an untested synthetic compound to market as a “supplement” and selling a million dollars worth of it is just being a nice guy. There is a patent http://www.trademarkia.com/osr1-77662378.html now the owner in CIT Ireland, and there is also an office in Stockolm. Boyd Haley is not allowed to sell his stuff in USA, so now he will sell it in Europe. He is in touch with Lorene Hamet, Corinne Skorupka, Robert Nataf, and some other french, belgian, swiss, anti-vaxxers or anti-dental amalgams people. What came into the mind of European health authorities? He would have proved that his product would act on the mercury poisoning. And they believe that he will sell it only to the really poisoned people with heavy metals? Other thing, are you aware about this https://www.change.org/p/european-parliament-european-commission-council-of-the-european-union-respect-promote-and-protect-freedom-of-informed-vaccination-consent-throughout-europe Anna Watson is co-Secretary of the European Forum for Vaccine Vigilance (EFVV) for the United Kingdom. Barbara Loe Fisher, is member of honor of this european association, so we come back to autism. Maybe you would like to watch his lectures where every single point he makes is backed with peer reviewed studies before knocking someone of his calibre. If you believe the FDA you are a fool. Explain in detail. Provide those PubMed studies that dispute the FDA. Please give me a link to where he discusses the study showing safety and efficacy of his synthetic compound in humans. It is amusing that you assume I haven’t watched his videos. Watching videos and reading papers by proponents of vaccine causation is what convinced me that they have no evidence. They really are that bad. I have a son with autism. Anecdote # 1: His autistic behavior began, coincidentally, with the one year vaccines. His reaction to the vaccines was immediate and severe. He never spoke another word or smiled or behaved even slightly normal until we started the GFCF diet a year later — we did not know hat happened at the time, it took a year for us to figure out he had autism. His physican at that time said “put him in speech therapy.” That does not work, when he does not speak. We switched to a DAN! doctor at that time, and with diet and supplements, things improved considerably. Anecdote # 2: While it was available, his doctor suggested OSR#1, which provided the greatest improvement in behavior of any supplement which we used. Was it chelation? Antioxidant properties? Of that I am not sure, but it had a very positive effect on his behavior at the time. So, what evidence was given to you that OSR#1 was proved safe and effective? I ask because there are none. In fact, some of the safety data taken by Mr. Haley was not made public until the FDA shut him down. Anecdotes are all over the web of the “benefits” of chelation for all sorts of conditions, including autism. People believed their anecdotes, but they were not true. Even DAN! has largely moved away from chelation and it is rarely used even. Gere is a non anecdtote–autism is not caused by mercury poisoning. Autism is not like mercury poisoning. Animal studies have shown a loss in cognitive ability when they are chelated and do not have heavy metal intoxication. That’s a pretty serious consideration. Chelation is not without risk. I’ve seen so many claims over the past 10 years. Heck, Jenny McCarthy got herself back into the public’s eye by making all sorts of claims–including that her child was no longer autistic. Now we hear that he is, indeed still autistic. We all make our choices. Had my doctor recommended OSR#1, I would have fired him on the spot. Seriously. I can point you to all sorts of things that coincided with improved behavior and abilities in my child. Including reintroducing dairy to his diet. The fact that Boyd Haley made over $1M in sales on a product mislabled as a “supplement” should have landed him in jail. But for some reason alternative medicine is protected in this country. How do you know if you did not try? I ask as a parent of a child who was non-verbal at age three, but did get speech with intensive therapy. While his speech is not perfect, he can carry on a conversation. Autism is a developmental issue, sometimes it just takes longer for the child to get to those milestones. Your child may have achieved those milestones without the industrial chelators. Why would you risk you kid’s health with those untested chemicals? Face it, the timing of vaccines and first signs of autism are just coincidental. Two weeks after my son had his MMR he had terrible seizures. Do I blame the vaccine or the very very nasty gastrointestinal disease he got that caused him to blow through diapers and vomit at every turn which caused dehydration, hence an imbalance in brain chemistry that turned into very nasty seizures. Do tell me, was it the vaccine or the disease that caused the massive seizure? Yes, “His physican at that time said “put him in speech therapy.” That does not work, when he does not speak. ” is rather problematic. There’s a guy at Hopkins named Barry Gordon. He’s specialized in working with older autistics who are non verbal. And has taught verbal speech. Speech therapy can also be communication therapy–getting alternative methods of communication in place. Exactly. My son’s first expressive language was sign language. He did start to attempting to speak when he started in a special ed. program that used sign language and lots of modeling, plus speech therapy. This is one thing that disgusts me with the unproven “alternative” stuff being pushed at us: I was told I wasn’t doing anything for my son because I did fill him up with supplements, chelators, etc, while all the time I was taking him to intensive speech therapy, the neurologist, preschool, and inclusive play programs. And a speech/language therapist who works at a special ed. preschool run by the university’s autism center was not terribly happy when parents claimed the “alternative” stuff they were feeding their kid was the reason for the child’s speech gains, not all of the therapy she provided at no cost to them. Boyd Haley got OSR to the market to help people as soon as he could. The FDA approval process for a drug can take years and is extremely expensive. Why do you have such blind faith in the FDA? How many times has the FDA approved a drug or medical device to later find out that it is seriously hurting people? In the 20th century there were doctor recommended cigarettes…you think they were right then? As far as vaccines go, who do you think profits from the use of vaccines? Who funds the “independent” studies? Pharmaceutical companies, Period. Vaccines are advertised on TV just like McDonalds Happy meals….it’s big business…does this not seem like a conflict of interest? How many pediatricians would be out out of business if they did not support vaccines?…”baby well” visits are literally in place to receive mandatory vaccines, paid for by insurance in which the doctors make serious profits…would a doctor that makes serious money from vaccines have any interest in not supporting them?! We’ve got to stop drinking the koolaid and wake up. Too many assume that positions of power command unquestionable respect. Truth and Change will only come when people challenge the establishment…any organization left unchecked is a breeding ground for corruption…look at the elected officials in the US government…what a joke. Please provide the PubMeb indexed economic studies that pharmaceutical companies profit more from preventing diseases with vaccines than they do by treating diseases by selling antibiotics, drugs to help those on mechanical ventilators for pneumonia, and cancer treatment for vaccine preventable cancers. Seriously, tell us why it is cheaper to treat diseases instead of preventing them. And also explain why you think the FDA has powers that extend into countries like Canada, the UK, Japan and elsewhere? Oh, wait. You cannot tell the difference between tobacco advertisements with actors and real medical reports! The link between tobacco and cancer was well established in the 1950s, only idiots believe magazine ads. I believe you have drunk a certain flavor of that powdered drink mix, and it is not good. And vaccines are anything but “profitable” for pediatricians – surveys and reports show that most practices barely break even & many, in fact, lose money on vaccines, given the current reimbursements rates…. Real mature replies…just about what I would expect. That proved my point more than anything. Aren’t you the person saying “we have to stop drinking the cool aid”? Except he didn’t even follow the rules for dietary supplements. He had no safety studies for its use in humans. So you think that a substance, which has not even been shown by its inventor to be safe, should be released freely? And, since it actually is a drug and not a dietary supplement, he should also have shown that it was effective for the indication he was trying to market it for, namely autism. He didn’t bother doing that, either. Essentially, what you are advocating here, is that any crank that comes along making claims about a substance should be able to market and sell it without any evidence that his claims are actually true. How many times has the FDA approved a drug or medical device to later find out that it is seriously hurting people? First you complain that they take too long to approve things, then you complain that they recall things that end up being more harmful than originally thought. Not only is this a non sequitur (the FDA has only had the power to regulate tobacco since 2009), the second half betrays a sad inability to distinguish advertising from fact. Funny. I said the FDA shut him down. I don’t need faith to accept a fact. How many millions of people have died because of the bureaucratic loggerheads of the FDA and its testing protocol and red tape? The FDA is not there to protect people, but as with any other bureaucratic entity, ever wasteful, it is there to feed from the govt. trough and to control. The bureaucratic-administrative state, as shadow, de facto law-making body, does not command the high ground. But it appears that many on this site, albeit highly intelligent (paradoxically enough) and very well educated, suffer significant confirmation bias. Lastly, and not least, what about MY choice, based on my gathering of information, and of the free market (and individuals) regulating themselves?! This appeal to, and reference of, the regulatory bureaucracy is without merit and most onerous. How many people have died due to fake medicine? Paradoxically enough you want to promote the sale of fake medicine and don’t care about any evidence of safety or efficacy. Where is the safety and efficacy data for OSR? That’s right, there are none. You are welcome to eat as much of this industrial chelator that you wish. Just don’t give it to a child. How many American babies were affected by thalidomide? Someone is free to consume OSR. Just as one is free to eat beach sand. One is not free to manufacture it and sell it as a “supplement”. One is not free to call a novel synthetic compound a “supplement” while telling the customers it is a chelator but “wink wink” we will avoid doing safety studies and we know you will buy it even without safety studies. Because whatever skepticism you have for big pharma is forgotten the moment someone markets an alternative to medicine. @Todd W: Don’t confuse obsessean with facts. He/she prefers to believe the “Phama Shill” nonsense and that the US has an effect over the entire world as far as vaccines go. Besides, Boyd Haley *says* that it’s not dangerous. That should be good enough, right? I mean, if you can’t trust a chemist who’s selling his own invention to treat children over the FDA, who can you trust? No conflict of interest there, he’s doing it from the selflessness of his heart! As per FDA protocol? I see that I did not take into account that this discussion centers on the use of OSR on children, but I have not been able to access information on this drug, or for that matter, can I find anywhere that sells it stateside? I don’t need three rounds of expensive FDA mandated testing to tell me that this drug is safe (as far as an agent that removes heavy metals effectively) enough, just as the FDA did not find it necessary to restrict the sale of DMPS, DMSA, and ALA for the same purpose. I was very ill from metal toxicity (mercury and lead), and even developed frank symptoms of same, complete with “gong mad”, the itching and burning, skin crawling sensation, and an appreciable degree of cognitive impairment (probably on account of the fact that I was unable to sleep more than an hour or two a night, without awakening to a racing heart, horrible anxiety (I finally relented and took ambien for about a month, while I sorted out my symptoms and got the diagnosis that confirmed my worst suspicions. I would never wish what I went through on my worst enemy-if I had one. You may not need a demonstration of safety or efficacy. You are able to experiment on yourself. I find it interesting that you claim (and yes, only claim) heavy metal intoxication but never mention going to an actual specialist. People who forgo using medical toxicologists for online “cures” like the Cutler protocol are, well, irresponsible with their own health. Promoting that to others crosses the line from exercising your own freedom to harming others. And I’m sure in your legal growing operation where you were so careless that you supposedly poisoned yourself, you were very careful to discard the marijuana you contaminated, right? You neither sold nor shared any, correct? You neither sold nor shared any, correct? If he was using CFLs, he didn’t have enough to sell; they’re only suitable for very small scale cultivation. Why the hell they would constantly be getting broken is anybody’s guess. He earned extra notoriety for trying to coin the phrase “mad child disease” (yes, a variation of mad cow disease) for autistic children. This is a disingenuous slur. Mad Child Disease is obviously a ploy on Mad Hatter’s Disease, and not Mad Cow Disease. Such a pity that OSR#1 is providing some relief for persons who have been injured by vaccines. This appears like a witch hunt. Trials of vaccines should be revisited. Most of those seem to be done on older children (would that be considered child abuse?) or older people that consented to being part of a trial (because they get paid), and not on babies (heaven forbid), and this is primarily who gets vaccines. Too bad none of that is true. Let’s see, the guy sells a synthetic compound as a “supplement”. What exactly does it supplement? Your body has NEVER seen OSR#1, so it’s NOT a supplement. He lied to you. But that’s OK, because he says it fixes non existent vaccine injury. Why has no one discussed the copious quantities of research that proves that autism is a pervasive neurodevelopmental disorder, and is therefore already there before the child is born? Not sure what that has to do with the article above.